The successor to last year's BlackBerry Keyone has passed a couple of major milestones in its journey towards officialdom. 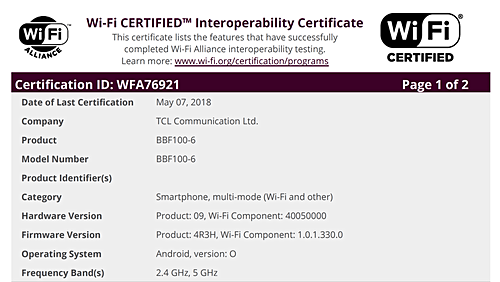 The device - which is likely to be called Key2 - has received Wi-Fi and Bluetooth certifications. Not much is known about the handset at the moment. Its TENAA listing had confirmed dual camera setup on the back, a 3.5mm audio jack, and a Type-C port. Rumors have also mentioned a Snapdragon 660 chipset with 6GB RAM, and Android 8.0 Oreo under the hood. Did you manage to gain root access on it? Hello Rumors about this phone are :Android 8 Oreo,6 gb of Ram,and snapdragon 660 proccessor. Is it same as as keyone in design? What about features? anything new?